Continuing the action and intrigue of the first two books, World Well Lost joins the ensemble cast of metahuman characters as they struggle against the growing powers of the Thule Society as well as Echo's own waning popularity. Famed fantasy and sci-fi author Mercedes Lackey and newcomers Dennis Lee and Cody Martin bring this superhero-themed braided novel podcast series to life with characters such as the Seraphym, Victoria Victrix, John Murdock, and Red Djinni, with stories read by Veronica Giguere. 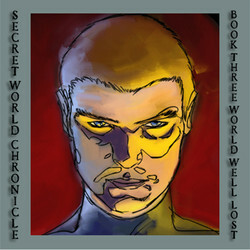 We will send The Secret World Chronicle, Book Three: World Well Lost to your Kindle at . The Secret World Chronicle, Book Three: World Well Lost has been sent successfully to your Kindle!